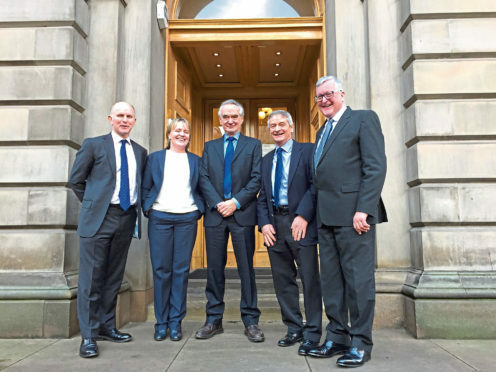 Rural Economy Secretary, Fergus Ewing, on the right, with the four agriculture champions. These are from left to right - Archie Gibson, Marion MacCormick, Henry Graham and John Kinnaird. The Scottish farming sector needs to change to tackle the challenges posed by Brexit. That was the conclusion of the Scottish Government’s four agriculture champions in their final report to ministers. The champions say change is needed, in terms of policy and mindset. They have called for a two-stage, long-term vision for the sector which is based on what the public wants and values in farming. In stage one of the vision, policies would not be changed radically, but an emphasis would be placed on encouraging industry and businesses to become more entrepreneurial and farm funding would be maintained at current levels. In the second stage, an element of basic income support would continue, but at a lower rate, and the majority of funding would be allocated to schemes that boost productivity and enhance natural capital. This would be tailored to regional or sectorial needs and capped per farm. Rural Economy Secretary Fergus Ewing said the findings from the report fed directly into his thinking on developing a future farming strategy. NFU Scotland welcomed the champions’ report and said it complemented the union’s own vision document, titled Change. The four champions were tasked with advising on the development of a new strategy. They are: Henry Graham, Scottish chairman of Lantra; Archie Gibson, former chairman of the Scottish Food and Drink Federation; John Kinnaird, farmer and former NFUS president; and Marion MacCormick, a former buying director for Aldi.